What to do with 30 bunches of organic celery? Last month, Azure Standard had a box of organic celery on sale for $11.25 ($12.21 w/tax). Each box was guaranteed to contain at least 30 bunches of celery, which is what I received. So, each bunch of Organic celery cost me $0.41/each. So, what did I do with ALL. THAT. CELERY? Well, I started by chopping it up. I had two bowls full. Each bowl contained 15 bunches of chopped up celery. 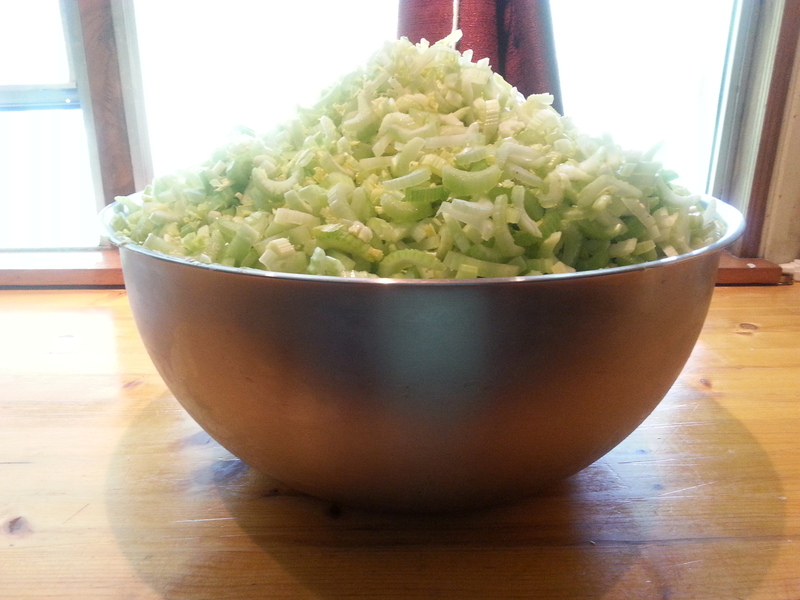 1 of 2 bowls full of organic chopped celery (15 bunches). 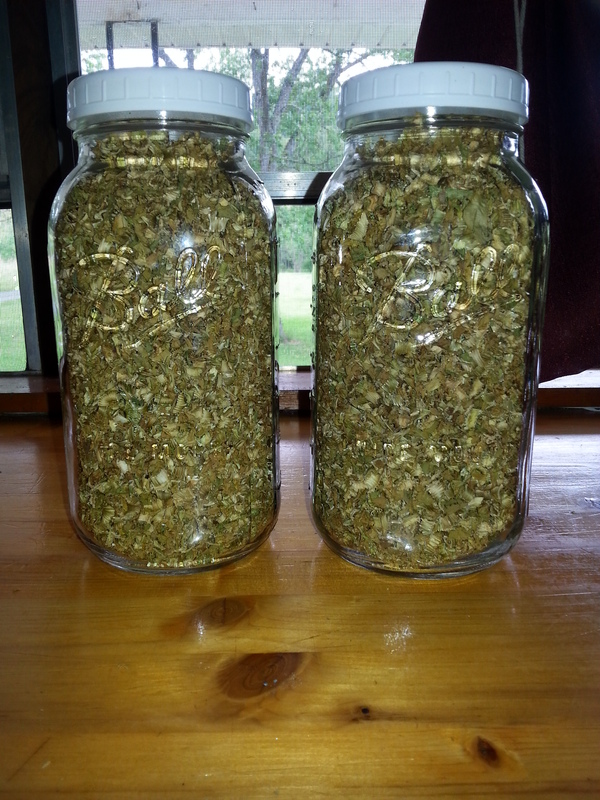 Two half gallon canning jars full of dehydrated celery! I will end up grinding some of this up into a powder to go into my vegetable powder mix that I keep on hand, but I will leave most of it as is for now. It will be used soups & stews in the coming months, especially in the winter. While celery is easily accessible all year long and not overly expensive (usually running around $0.97 to $1.30/bunch), buying organic can cost even more. But, at $0.41/bunch, I now have plenty on hand whenever I need some for a dish. These pics do not include all of my dehydrated potatoes, carrots, peas, corn, vegetable powder, tomato powder, dried basil, peppermint, rosemary, & thyme. Or my frozen corn on the cob & zucchini. I also canned some ground beef & ground venison a couple of weeks ago. I opened the first one the other day for spaghetti & it was good. So nice to have the precooked meat ready & waiting for me to add to our sauce. There’s still more to go. One of my neighbor’s is allowing me to pick a few pears from their tree (Thank you!! ), and I’ve still got potatoes that need to be processed. Plus, I’ll be going Monday to pick okra (more free food for which I’m very thankful!!) and I’ll be going next week to pick one more round of tomatoes before they’re all gone for the season. AND, I’m hoping to go get some apples before too long. Thankfully, apple season is really just getting underway so I’ve got some time before I need to worry about that. I’m also keeping my eyes out for marked down produce whenever I go out to my local grocery store. I also plan to can more dry beans & soups before too long to keep on hand for some quick grab meals, especially lunches for my sweet, hardworking husband, Brian. 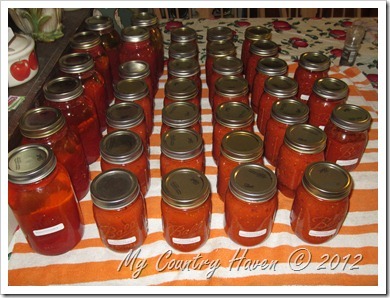 If I keep this up, I’m going to have to really add to my canning jars next year! But, I’m so thankful for this knowledge and ability. Being able to provide for my family in this way is wonderful. I thank God daily for my loving of all things related to cooking/baking/preserving. 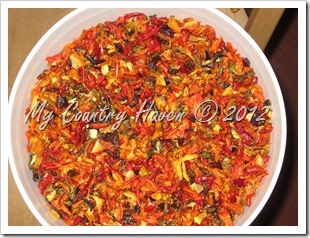 As you already know, I absolutely LOVE my Excalibur Dehydrator ! 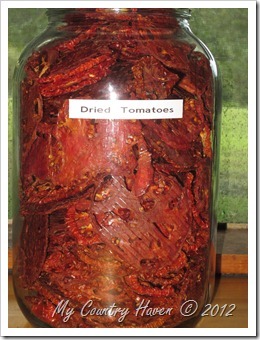 Well, with all of those wonderful tomatoes that I had, I decided to try some “sun-dried” (aka dehydrated) tomatoes. As a FRESH tomato lover, I have to say, “OH MY GOODNESS are they Delicious!! 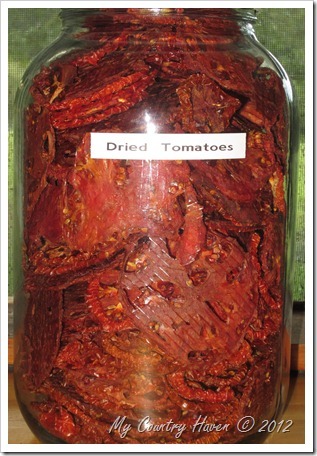 !” Dehydrating them brings out the natural sweetness in them plus enhances that tomato flavor! In fact, I love it so much, that I now have a whole gallon jar filled to the brim, just waiting for me to savor them this winter. These will be delicious in dishes, but also just as a snack! It was suggested that you could add extra virgin olive oil and salt/pepper to the slices before dehydrating, but I just dehydrated them as they were. They really don’t need anything! The flavor is wonderfully refreshing. But, I might try a few different ones later on just to see what they taste like. I’m sure they will be delicious, too. 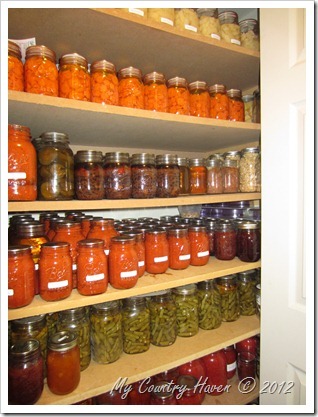 Oh, what a wonderful time we live in where it’s so easy to preserve foods for the long winter months ahead. We will be eating well, that’s for sure! I’m thankful to God daily for all that He is providing for us, and I’m trying my best to not let any go to waste. 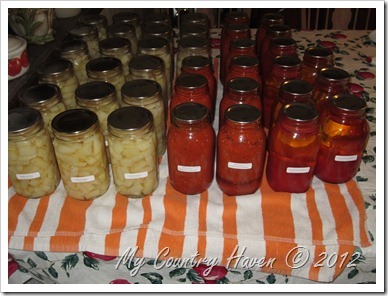 Preserving season &Homeschooling are now in full swing!! 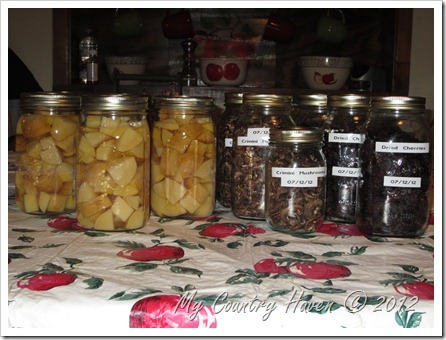 Even with the bad gardening season (especially for us since we didn’t even get one in this year), I’ve been extremely busy canning & dehydrating these last few weeks, as well as getting ready to begin an important year in the life of our homeschooling. Melia, our oldest, is a Senior this year & Katie, our middle child, is a Freshman! I still have one that has 1 foot in elementary school and is trying to stick the other foot into middle school, but I thankfully have 1 more year before that happens! 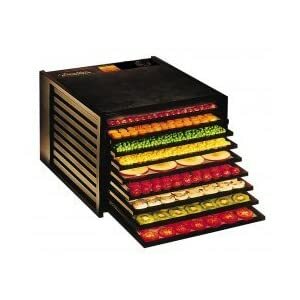 As I mentioned before, I’m in love with my new Excalibur Dehydrator! I have been keeping it busy, let me tell you! 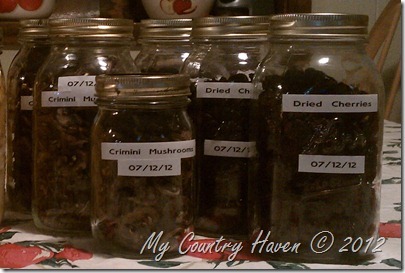 With my last Azure order, I purchased 60 more ounces of Crimini mushrooms & 40 lbs of onions. Out of the 40 lbs of onions, I dried 42 & still have about 12 left over. Those 42 onions, filled 4 quarts!! I rough chopped them before drying them so that I will again have the option of either having dried minced onions, or placing a few in my grinder for onion powder as needed. I love having this flexibility. While I can say that I dried them in the house & the odor was strong for a short time, it really wasn’t as bad as people say. Although, I family did avoid my pantry area for the first couple of hours. Of course, I also dehydrated my mushrooms. I’m so thankful that I went ahead and purchased another flat of these delicious mushrooms because the price went up shortly from $18.00/60 oz to $26.00/60 oz after placing my order. No more of these delicious mushrooms for me till the price comes back down! I’ve also dehydrated some celery (since I somehow wound up with way more than we would get eaten before it went bad) and a few more carrots. I do have a few more head of garlic sitting in my kitchen that I’ll probably be dehydrating as well since there is no way we will get it all eaten before it starts to go bad. Even though it’s fresher coming fro Azure, the outer cloves still have a tendency to want to spoil fairly quickly, which I’m assuming is from the drastic temperature changes that it goes through from being placed on the truck, shipment, & then being removed from the truck once it arrives. No biggie since I know this can happen & I will deal with it accordingly. After really losing my desire to want to can for a few years, I’m so very thankful that I did find my love for it once more. While it is a lot of hard, tiring, & sometimes back-breaking work, I do love seeing all those beautiful jars of fresh foods lined up on the shelves just waiting for my family to consume them in the coming months. I know that my family will be eating healthier because of it because a lot of the food that I’m putting away will be BPA (no store cans) & preservative-free, & some will have been naturally/organically grown, which is even better. I’m working on a tally of what I’ve canned so far this year. As soon as I have that post ready, I’ll come back here & add a link. Now, as for homeschooling, it’s going to be an exciting year for us! It’s hard to believe that my “baby” girl is a Senior this year & will be graduating from high school. She is so excited. And, while mom & dad are excited, every parent out there knows that it’s also bittersweet. Not only does it signify a new chapter in her life, but also a new chapter in our lives, as well. We are so proud of the young lady that she as become & know that God has something special in store for her. We are excited to see where He leads her in the coming months/years. And then we also have another child entering high school. I can’t say that she’s overly thrilled at the amount of work that she has to do, but she’s pretty excited about this new chapter in her life. Mom & dad, however, are really beginning to realize that their babies are growing up way too fast & that there’s not a lot of time left that we will all still be together as a family unit before they start really spreading their wings & flying. While we know that this is what we are raising them to do, it’s still hard to believe that it has already been long enough for these events to be right on our doorstep. God has truly blessed us with 3 wonderful children. We pray daily that He will watch over them & guide them in these crucial moments of life where they are just beginning to have to make tough decisions, & that He will help guide us as they look to us for wisdom & guidance to help them make the best decisions for their lives. Update On My Excalibur Dehydrator!! I’ve had my dehydrator for just under 2 months now & I couldn’t be happier with my purchase! I’ve enjoyed being able to dry so many things already & we’re still in the middle of growing season here in Southeast Tennessee! 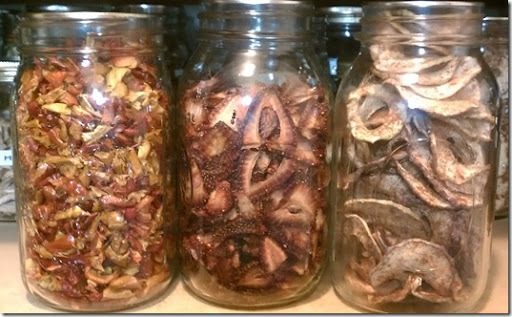 If you follow me on Facebook, you’ve probably seen several of the items that I’ve dried so far. While I’ve had to add a little extra drying time to several of the items due to increased humidity (and a very few days of rain), everything has dried exactly like it’s supposed to. 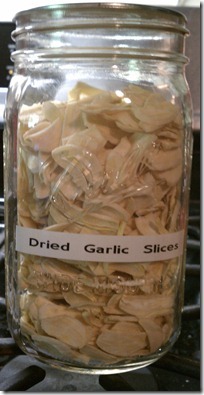 Yesterday, I dried 130 cloves of garlic, sliced!! Isn’t it beautiful!! I’ve also dried strawberries, bananas,apple rings, bell peppers, jalapenos, green onions, banana peppers, onions, and various herbs. I’m so thankful that God has blessed me with a love for cooking, baking, canning, & putting food up for my family. 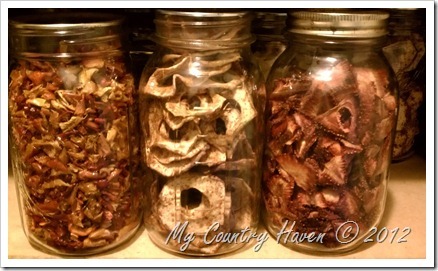 It truly is a labor of love that I enjoy, & I enjoy knowing that I have helped to save my family money & stretch my husband’s paycheck by preserving foods in so many ways.